Size of this preview: 342 × 598 pixels. Other resolutions: 137 × 240 pixels | 2,737 × 4,788 pixels. Scansione di una pubblicità Diplomatic Patented Pen datata 1955-12-02. Pubblicata su: Tempo, anno XVII, n. 51. Data ottenuta da quella di pubblicazione del volume da cui la pagina è estratta. Pubblicizza le penne denominate DP2, probabilmente le prime con caricamento a converter (a "cartuccia ricaricabile"). Ritoccata dall'autore per una migliore nitidezza. Scanning of advertising from Diplomatic Patented Pen dated 1955-12-02. Published on: Tempo, year XVII, n. 51. Dating established by the publication date of the volume from which the page is taken. 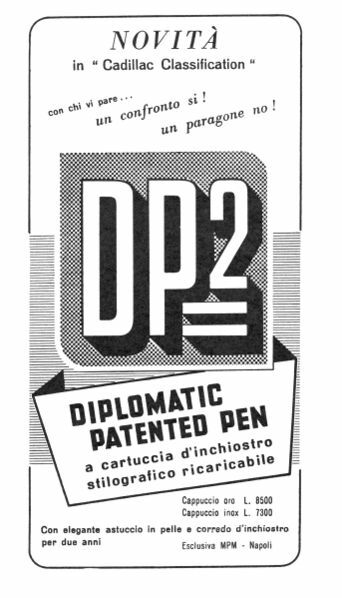 Advertising for the DP2 pens, probaly the first one with converter (refillable cartridge). Retouched by the author for a better sharpness.